More of my notes from the Society’s 2015 National Conference in Chicago, 6/24-27. Part 1, Part 2 and Part 3. Sorry to be posting so long after the event but I still find them useful… and going through my notes may help me remember some of the more interesting points. Believer: My Forty Years in Politics @davidaxelrod I’m not sure why David Axelrod was a featured speaker. Has he played a key role regulating corporations? Maybe he was there to inspire. I found him inspiring and interesting. “The future is not a gift, its an achievement.” (Bobby Kennedy) There are those who run for office because they want to be someone and those who run because they want to do something. He is troubled by cynicism and went to work for Obama when he ran for US Senate. 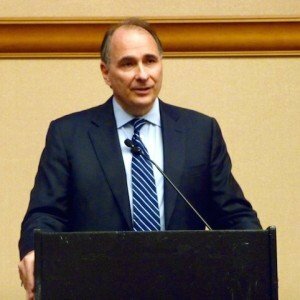 David Axelrod fears we’ve moved to a short-term society. Lincoln had the long-term vision – transcontinental railroad while fighting Civil War, established National Science Foundation, signed the Morrell Act. Need multi-layered campaign to tell how companies have embraced diversity. Here’s a few of the tweets during Axelrod’s talk. Look at board policies. Think through how policies may change with an activist on the board. In 75% of cases an activist will achieve something… often board representation. How do you find common ground? While lawyers talk, get a stand-still agreement. If the activist gets a board representative, what committees will they be on? If talks break down, you know you’ll have a proxy fight and the company has a good chance of losing. Companies will often start from the activist’s last settlement with another company. You’re only as good as your last settlement… those seem to ratchet up, rarely down. Trust is needed between the parties. The ones that settle are the ones where the management team is more open. Activist firms tend to put up 3rd parties. Is it appropriate to negotiate who they should be? No, the activist normally will have committed to specific nominees. Age issues… some activist nominees may be beyond age limits set by the board. There has to be flexibility. Seeing more merit-based nominators… more women and minorities. Sometimes ‘fit’ is exactly what you don’t want. Collegiality isn’t the most important value. Sometimes there is already too much of that get along to not make waves. Mission is to increase shareholder value and sometimes that requires challenging. What committees? Activists rarely go on audit committee. They usually try to get two or three seats to cover all the committees other than audit (liability issues). Competing business plans. They have often talked to your stockholders much more than company has. Funds are now frequently calling activists alerting them of companies that need change. How does culture of board change? Incumbent upon chair or lead director to get parties to reach across the aisle. Typically, the fight is with management, not so much the board.